The article did say that the formula is just a guide. I actually charge more—I won't say how much unless you want to propose something haha—simply because I'm a writer by profession. I can guarantee clients that sponsored posts are well written, well edited and presented professionally—a service not a lot of other bloggers can offer. The article said you can skip the last operation (the divide-by-2) if you're a specialized blogger. The more niche your blog is, the higher you can charge. I think mommy bloggers, tech bloggers and beauty bloggers belong to this group because these are the blogs that get people to buy. Lifestyle blogs, gossip blogs, news blogs, travel blogs, they might get lots of readers but no one reads blogs like those to shop. These blogs are for information so if you're a brand that has something to announce, you target the popular blogs but if you want to sell, you go after the niche blogs. 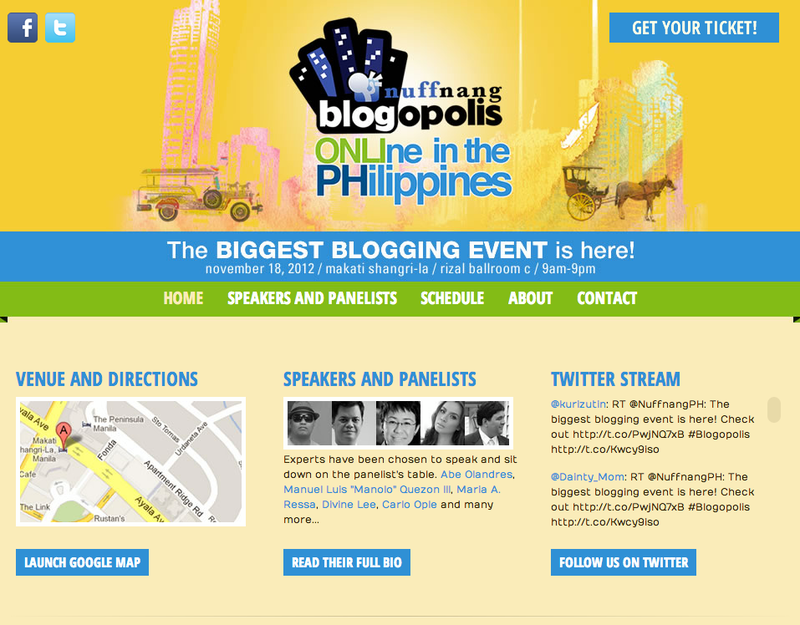 So even if your blog is small, take heart! As long as it is targeting a specific audience, it has a chance to still earn you money. I was telling Jenny Ong of Chronicles of a Nursing Mom this and... I'll just copy-paste what I wrote her so I won't have to re-type what I said! I think sponsored posts should be equal or greater than your ad rate. Why? Because you have to write it (effort!) and you have to endorse the product/service. It's your integrity on the line. For example, hmm, let's pick a brand I don't use... Okay, Louis Vuitton. 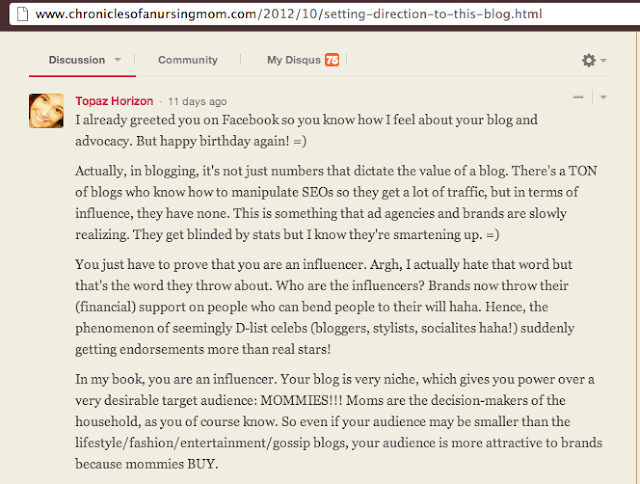 LV can place an ad on my blog to target my readers. You see it, you click on it, but it's not connected to me personally. But if Louis Vuitton asks me to write about their brand, talk about it personally, recommend it, I won't be able to unless I actually own and love an LV bag! Anyway, just thoughts I wanted to share with you to help you along. I know a lot of you want your blogs to grow and earn you money. There's a big blogging event coming up called Blogopolis. It features the top bloggers and social media experts of the country and they'll reveal how you can get a constant stream of ideas, how to capture an audience, how to market your blog, how to increase readership, how to get and deal with advertisers, and a whole lot more. I'm sure it can help out a lot of bloggers struggling to earn from their online activities. I won't be there—a full day seminar just doesn't work for a mommy like me!—so just tell me what happened, okay? I do know one big secret to successful blogging: Blog for yourself, not for the money. Blog about what makes you happy, whether it's DIY crafts, your dogs, your Star Wars collection. This will give your blog its own voice, its own personality—yours!—and make it unique. After all, there is no one quite like you in the entire world. Once your blog feels like a real person is writing it, it will begin to attract its own special group of readers. Then your blog grows and then it starts attracting sponsors. It's the same with life really, make yourself a happy and interesting person and people will want to be your friend. So be yourself, be happy, have fun. The rest will follow. i love your blog lay-out! I believe this: "Blog for yourself, not for the money. Blog about what makes you happy, whether it's DIY crafts, your dogs, your Star Wars collection. This will give your blog its own voice, its own personality—yours!—and make it unique. After all, there is no one quite like you in the entire world." Sikat101, yep, to thine own self be true because there's no one like you! I started using the formula when I first read about it. But, after I consulted with some pro bloggers (from the U.S.), they said to look at sponsored posts as a writing gig, just like my other freelance gigs. So, I began charging for sponsored posts according to my rate as a writer. (Writing for print, though, has different rates.) Basically, "charge what you're worth," so that takes into consideration time and talent. Like you, I put a lot of thought into my sponsored posts, and brands have noticed (yay! ), so they are willing to pay for it, even though my traffic isn't as high yet as yours, teehee. Excited nako for our next kita-kits. thank you for the idea! i started to receive ad inquiry but i don't know to handle that, mainly because i don't know how to charge. I'm blogging for the love of sharing, writing and socializing.